A unique disposable brief that keeps skin healthy and dry! Restore®/Remedy™ disposable briefs have 100 percent breathable side panels. Improved airflow not only keeps residents more comfortable, it also helps to reduce skin irritation. Ideal skin protection is built right into every Restore/Remedy disposable brief. That’s because each brief’s inner liner is coated with Medline’s Remedy™ Skin Repair Cream. This exclusive, all-natural cream helps provide skin protection. 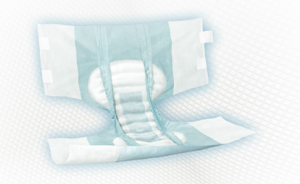 The absorbent UltraCare core helps provide maximum dryness for improved comfort and healthier skin. Skin-safe closures with “grab anywhere” technology allow for the best possible fit and also reduce waste – now caregivers can quickly check and refasten briefs. Anti-leak cuffs perform up to 20 percent better than standard cuffs, which helps to protect clothing, bedding, etc. The cloth-like outer cover is comfortable against skin, helping to reduce irritation and rashes.